NATO detected and monitored four groups of Russian military aircraft, conducting significant military maneuvers in European airspace on October 28 and 29, 2014. These sizable Russian flights took place over the Baltic Sea, North Sea/Atlantic Ocean and Black Sea. These activities represent an unusual level of air activity over European airspace. Fighter aircraft from Norway, Britain, Portugal, Germany and Turkey were scrambled in response. Tensions between Russia and NATO countries have soared over the Ukraine crisis. Russia initially denied that its military played a part in the unlawful annexation of Crimea. Putin later admitted that the Russian military did indeed participate in the incursion. Similar denials are now being uttered with respect to Russia’s Hamas-like activities in Ukraine, while the deaths of Russian soldiers are being willfully concealed. As the West continues to press on with sanctions against Russia, the wounded bear is attempting to assert its might with military maneuvers. On October 29, 2014, NATO radars detected and tracked eight Russian aircraft flying in formation over the North Sea. F-16 aircraft from the Royal Norwegian Air Force were scrambled, intercepted and identified the Russian aircraft. The formation included four Tu-95 Bear H strategic bombers and four Il-78 tanker aircraft, flying from mainland Russia over the Norwegian Sea in international airspace. Six of the Russian aircraft then turned back towards Russia, but two Tu-95 Bear H bombers continued to travel parallel to the Norwegian coast, over the North Sea. Typhoon fighters from the United Kingdom were scrambled in response. While they were traveling over the Atlantic Ocean west of Portugal, the two Russian aircraft were intercepted and identified by F-16s from the Portuguese Air Force. The Russian aircraft proceeded to turn back, flying to the west of the United Kingdom. NATO aircraft from the United Kingdom and Norway were standing by, while NATO assets on the ground and in the air tracked the Russian aircraft throughout. The bomber and tanker aircraft from Russia did not file flight plans or maintain radio contact with civilian air traffic control authorities. They were not using on-board transponders. This poses a potential risk to civil aviation, since civilian air traffic control cannot detect these aircraft or ensure there is no interference with civilian air traffic. During the afternoon of October 29, 2014, NATO radars detected and tracked four Russian aircraft flying over the Black Sea in international air space, including 2 Tu-95 Bear-H bombers and 2 Su-27 Flanker fighter jets. Fighters from the Turkish Air Force have intercepted the Russian aircraft and NATO continued to track them in international airspace. During the afternoon of October 29, 2014, NATO radars also detected and tracked a formation of Russian aircraft flying over the Baltic Sea in international airspace, including 2x MiG-31 Foxhound, 2x Su-34 Fullback, 1x Su-27 Flanker and 2x Su-24 Fencer jets. Portuguese F-16 Fighters assigned to the Baltic Air Policing Mission were scrambled in response. The Russian aircraft then returned to Russian airspace. One day earlier, on October 28, 2014, NATO radars detected and tracked seven Russian combat aircraft flying in international airspace over the Baltic Sea. The aircraft were detected at approximately 2:30 p.m. CET on October 28, 2014 and included 2x MiG-31 Foxhound, 2x Su-34 Fullback, 1x Su-27 Flanker and 2x Su-24 Fencer jets. The Russian aircraft were flying in the Gulf of Finland and were intercepted by German Typhoon fighter jets from NATO’s Baltic Air Policing Mission. Russia’s aircraft continued to fly over the Baltic Sea and were subsequently intercepted by Allied fighters from Denmark as well as fighters from Finland and Sweden, which are not members of NATO. 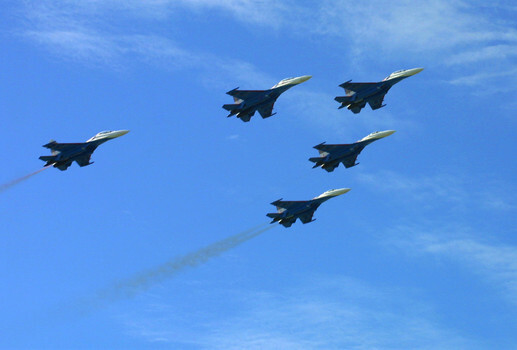 Russian fighters then returned to their own airspace in the Kaliningrad Oblast. The Russian aircraft in this scenario did file a flight plan with air traffic control authorities and were using transponders, but failed to maintain radio contact with civilian air traffic control. To date, NATO has conducted over 100 intercepts of Russian aircraft in 2014, which is about three times more than those performed in 2013. Russia’s defense spending dramatically increased and shows no signs of slowing down. Russia’s Finance Minister recently warned that the country could no longer afford a multi-billion-dollar revamp of the armed forces approved by Putin. Russia’s defense spending under the original plan would cost the beleaguered nation 23 trillion roubles ($576 billion) by 2020. As Russian ruble falls to new record lows, more military posturing can be expected.